"Sometimes I think, and sometimes I am." My 3 1/2 year old neighbor Milo, sees me out on the porch quite often. He asked his mom, Francine, "Why isn't Drew silly all the time?" Francine: Because sometimes he's thinking about how to be silly. Milo: I don't have to think about being silly. I can do it anytime! Look—lao blao lao blao lao blao lao blao lao blao lao blao lao blao lao [accompanied by silly faces and movements]. 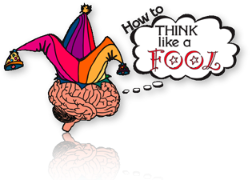 If you've been following and practicing this series on how to think like a fool, you now have a lot of fool tools in your arsenal. Forget them all. Now is the time to trust, quiet or distract your chattering mind, and simply act like a fool. Be a fool.